You say to-may-to, I say to-mah-to. He says novella, others say novel, I say long story, a sometimes long, indecipherable story. In the far future — sixty-six million years, give or take a million, from now — a spaceship trundles across the galaxy planting wormhole gates. The ship, the Eriophora, is powered by a black hole, sent on its mission in the 22nd century by people who probably have no discernible descendants sixty-six million years in the future. So what is the purpose of the 100,000 or so gates anyway? Nothing but monstrous cankers, giant bubbles, or gremlin-like things have ever emerged from them, to the knowledge of the 30,000 humans who help to build the gates in shifts. Sunday Ahzmundin is our narrator. She has a particularly friendly relationship with the primary AI that maintains the ship while most of the humans lie in crypts, literally dead to the world, awaiting resurrection to serve their shifts. “The Chimp” is what everyone calls the disembodied AI who controls the ship, targets missions, and looks after the humans. Surely, it is the servant and the long-gone Mission Control on Earth is still the master. Hmmm. Sunday is part of a “tribe.” Mostly she is roused from death to work with them, but sometimes she is roused to work with another tribe, just as others are rotated into other groups to avoid psychological and work stagnation. Time is spongy for the humans. In total, Sunday has maybe been activated (been alive) for a cumulative twenty years since blast-off, despite the passage of millions of years. During one work go-around and the presumptive beginning of Peter Watts’ story, one of Sunday’s group, Lian Wei, has a breakdown and eventually (centuries or millennia later) dies. Lian dies asking the ultimate question: What is the meaning of life? The humans on board have been engineered to accept and be happy with life on board their ship and with their amorphous goal of connecting the galaxy. But is that all there is? They all believe their mission will end when they receive a “call back” from Mission Control. In the absence of that call back, they continue to cast their gates. Until the end of time. Or until the ship has used up all the resources available in the galaxy to make the gates and space is too cluttered to move. In any event, that point in time (a very human phrase) is asymptotic, an event horizon that is never breached. 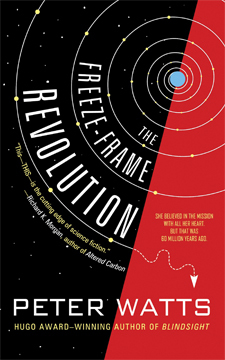 “Freeze-Frame Revolution” is very geeky. There is even an Easter egg for those willing to find and follow it. There’s even a sub-Reddit about that Easter egg. So, go forth and geek! 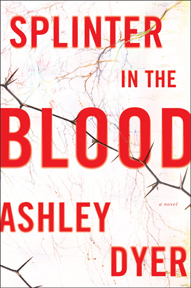 Ashley Dyer is the pseudonym for veteran crime writer Margaret Murphy (“Darkness Falls”) and Helen Pepper, a consultant with a real-life knowledge of forensics. Their collaboration features DS Ruth Lake of the Liverpool police force. “Splinter in the Blood” begins with the riveting scene of DS Lake holding a gun on her partner/boss, DCI Greg Carver, who has just been shot in the chest. The scene is meant to lead and mislead. Lake was a member of the police forensics team before she joined homicide, so she knows what to do to “clean up” a crime scene. She methodically wipes down surfaces and steals the work notes Carver has created in his search for “The Thorn Killer.” Is Lake The Thorn Killer? Well, no, Lake is not, because the killer is watching the aftermath of Carver’s shooting. The killer watches Lake work with the police in transporting Carver to the hospital — no, he is not dead — and in getting forensics started on the scene of the crime. Per protocol, Lake is then off Carver’s case. Lake is not off The Thorn Killer case, however. So far the killer has murdered five young women. Their bodies have been found with strange tattoos on them. Victim number five has the most and best lasting tattoos. The killer’s skills are improving. But what is the killer’s message? The new forensic police advisor, Dr. Lyall Gaines, part of the local university’s anthropology department, is brought in to speculate on the meaning of the tattoos. The latest victim, Kara Grogan, had been researching psychics shortly before her death, so the murder team follows down that road as well. Lake lives in fear that Carver will regain consciousness and of what he will say. Does he remember her role that night? Yes, he awakens. Yes, he remembers her. But everything is still hazy and he merely remembers Lake saving him. He tries to remain involved in The Thorn Killer case, despite his disabilities, which includes seeing woo-woo auras around most people. He and others think The Thorn Killer must have shot him and stolen his notes. Lake becomes obsessed with Vic #5, Kara Grogan. She is convinced the solution lies in what Grogan did in the last few weeks of her life. Although there are four other victims, only a cursory look is given to what they may contribute to the connection to a killer. That made the story a little weak to me, but the intrigue of finding out who The Thorn Killer was and why Carver was shot was compelling. There are many characters introduced from Kara Grogan’s group and DCI Carver’s personal life. Both indeed hid secrets from their closest friends and colleagues, and the unveiling is suspenseful and worthy of turning those pages as quickly as possible. It is these two whose characters are prised open and laid out for viewing most successfully. The rest, even DS Lake, are supporting acts. The Liverpool squad is certainly worth another look, should “Ashley Dyer” venture another tale or two. 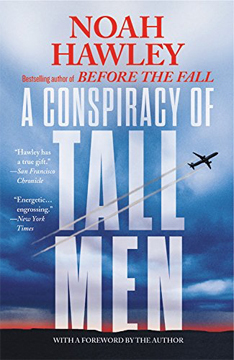 The last time we saw Noah Hawley in print, he had written a smashing thriller, “Before the Fall,” about a man who survived a plane crash and all the implications that had for him afterwards. This time, there is a plane crash but no one survives, and it is not a traditional thriller. In many ways, there are echoes of “Fargo,” the eclectic, quirky, linguistically athletic television show for which Hawley is a show runner. “A Conspiracy of Tall Men” is a reissuance of a 1998 book. Hawley populates his new book with people named Linus, Porter, Forbes, Preston, and Ford. There are other more mundane-sounding names, like Robert, but those five are the meaningful characters. Not that Claudia, the wife Linus mourns because she died in the plane crash, is insignificant, but she spends no time on stage. And not that Roy and Edward, Linus’ conspiracy cohorts, aren’t pivotal to the action, but they are the baby steps, not Big Foot. It is about 1998-99, just around the time Y2K adherents began really panicking and stockpiling goods. Linus Owen is a professor of conspiracy — although it has a fancier name at his college — in San Francisco, and he hobnobs with other socially awkward conspiracy afficianadoes, theorists, and geeks. His best friends are Roy and Edward. Edward is rich from an early Silicon Valley coup. He is twenty-four years old and retired. Roy was a logger. Now he limps and is divorced. Roy and Edward live next door to each other. Claudia is Linus’ wife. She is beautiful and has a successful advertising career. It seems, rightly so, that she and Linus have very little in common. But Linus loves her. That’s why he falls apart when officials tell him she died in a plane crash. The plane was heading to Brazil. She was seated next to a divorced executive who worked for one of her clients, a pharmaceutical company. They were holding hands. The plane crashed because a bomb exploded. What is the nature of a conspiracy? It is the darker side of human beings. It is a philosophical animal, the pursuit of which is a never-ending series of questions. It is the paranoia of the pharmaceutically disturbed, the insecurity of crowds, the resentment of the dispossessed. Linus also asks, why am I growing taller, why does my nose bleed frequently, what happened to the clothing of my youth, am I turning middle class as I turn toward middle-age? “At least try to tell me, before you put me in a hole, why it is I spent my whole life trying to prove that for every evil there is some nefarious, elite group secretly plotting." Wiley picks a piece of apple peel from between his molars. This is Hawley telling a fable or a myth about a quest the hero must engage in before finding out the meaning of life. This is no “Da Vinci Code” or “Hunt for Red October.” This is quirky and then quirkier. It reminds me a little of David A. Crossman’s Winston Crisp mysteries, still some of my favorites. *A colorful old-time wrestler. I loved the throwback reference. 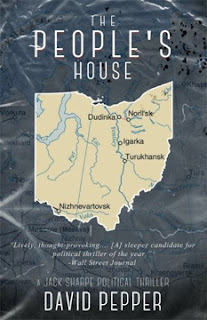 “The People’s House” is an exciting book about … gerrymandering. Not really, but yes, really. For almost twenty years, David Pepper has been involved in politics in Ohio. It has given him the background to form a fictional political thriller, and to levy a convincing real-life argument against dividing up our representational districts for the U.S. House of Representatives in such a blatantly prejudicial fashion. But that almost operates as a background hum. Reporter Jack Sharpe of the “Youngstown [OH] Vindicator” may work for a fictional newspaper but the horror of political manipulation of voting isn’t exactly fiction anymore. What Pepper presents isn’t a reality, as far as anyone knows, but the potential is daunting. Before Election Day in the United States of America, the Democrats hold sway in the House of Representatives. After Election Day, about thirty-five swing counties have unexpectedly swung in favor of Republican candidates, including some who are not very well known or favored. The House is now in the Republicans’ domain. There are now enough members of the House to pass an energy package allowing the placement of a massive network of pipelines to move a substantial amount of oil squeezed by fracking. Cui bono? Representative Tom Stanton (R-PA) who eventually becomes the Majority Leader. Oliver Ariens, a super-lobbyist, would be on the list of beneficiaries, but he died of a heart attack. Jim Gibbs, the Ohio Republican candidate, who won over Lee Kelly, the long-time Representative of their county. Lee Kelly was despondent after losing what should have been a sure thing. He stayed despondent until suddenly he wasn’t. He had discovered something, he told his wife. He had left a message for Jack Sharpe, but Sharpe never had a chance to talk with him before Kelly died in a fiery car crash. Pulling at the threads of what possibly could have interested Kelly, Jack acts as both reporter and homicide (if that is what it was) detective. The first question is what drove so many swing counties in the country to tilt toward the Republican candidates. Jack thinks he has an answer. In the process of compiling evidence to override legal objections from his newspaper, he uncovers another potential murder, this time of a young woman, an assistant to the odious Tom Stanton. This book skews to Democratic readers, although I would hope that everyone of every political persuasion could appreciate the book for what it is. Just switch the parties around if it would make you feel better — although historically, looser regulations for fracking in the oil industry have been more supported by Republicans than Democrats. And, may I add, this was published before the election of 2016. 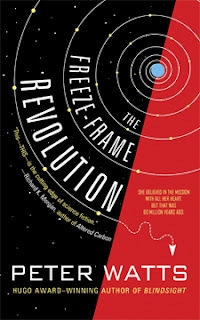 The bottom line: I highly recommend this book to all people who stand under our free-flying flag, long may it wave! “Rise the Dark” follows the first Markus Novak story, “Last Words” (c2015). A third book will follow as day does night, and that’s because Markus’ story is not yet over. Markus Novak is an private investigator in Florida. He is still mourning the death of his wife, Lauren, a couple of years previously. The man who he believes killed his wife, Garland Webb, has been released from prison. Webb sends Markus a gloating message, then disappears. There are answers in the little town of Cassadaga, Florida. A medium whom Lauren went to see in that town populated by many mediums, spiritualists, and other woo-woo people just before she died has agreed to see Markus. He hopes to find out what Lauren had gone to Cassadaga to find. Then he wants to kill Webb. A mysterious man and woman instead try to kill Markus in Cassadaga. That just makes him even madder. Unbeknownst to Markus and Lynn, a lineman from Montana, Jay Baldwin, provides the key to a disaster looming over the country. His wife is being held hostage by Eli Pate. Pate wants him to do something terrifying and dangerous. And Jay is going to do it. All parties converge on a compound in the wilderness. 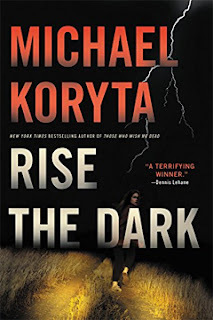 Who will die and who will live to fight another day in Michael Koryta’s sequel? “Rise the Dark” is done in Koryta’s trademark thrilling, fast-paced manner. Just don’t expect a total resolution at the end. 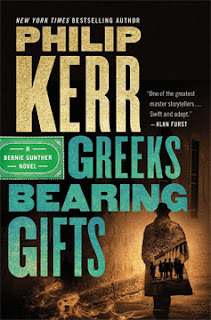 “Greeks Bearing Gifts” has turned out to be Philip Kerr’s last Bernie Gunther book. He died on March 23, 2018, shortly before this book was released. Did Kerr know this was to be his last book? If not, it is still a fitting coda to his opera. The sunset Bernie heads into at the end holds the promise of a more rewarding life. Bernie Gunther, now known as Christof Ganz, has managed to survive World War II in Nazi Germany without himself becoming a Nazi or carrying out heinous crimes on their behalf. He is to be applauded for his political juking ability, much like a top-notch soccer player runs a zigzag pattern in order not to be caught. It is now 1957 and Bernie has had to change his name in order to return to live in Germany. In order to get to 1957 in one piece, he has been a hotel worker in France and a political prisoner in Russia. He has worked for Nazi high command here and there and the police in Berlin. He has solved murders but most successfully managed to not get murdered himself, executed, or wantonly used and thrown away. Oh, wait, maybe not the latter. In 1957 Munich, Bernie is a mortuary attendant. It’s a humble but pleasantly quiet life. He talks to the corpses and none of them give him lip back. It’s a paradise compared to a Russian prison. Alas, all good, quiet things must come to a loud end. It comes in the form of a police acquaintance from way, way back. Criminal Secretary Schramma recognizes Bernie and blackmails him into “helping” him extort money. It’s a convoluted set-up and Bernie is the wary but inevitable patsy. But Bernie didn’t survive WWII on just luck. He manages to cotton to the game Schramma is playing and extricates himself in spectacular fashion. Bernie is aided by another old, old acquaintance, Max Merton, lawyer of dubious distinction, and, boy, does Max have a job for him. Soon Bernie is making lots of marks working for Munich RE, an insurance company, as an adjuster/investigator. In another convoluted situation — this is why the book is 528 pages long — Bernie is sent to Greece to “adjust” a maritime claim. Bernie knows bubkis about maritime loss, but he is given the assistance of a Greek liaison, Achilles Garlopis. A boat has sunk. It was both the workplace and home for Siegfried Witzel, a German who lives in Greece and films underwater movies and hunts for antiquities in the Mediterranean depths. Bernie smells a rotten octopus and secretly follows the taciturn claimant after a meeting. He is rewarded with a dead body. Then he is cursed by a Greek detective who threatens Bernie in order to get him to find the murderer. Bernie attracts odd characters who are interested in his investigation, including the lovely Ellie Panatoniou. If I would criticize the author for padding (excuse the expression) his book, it would be in his overblown (again, excuse the expression) and interminable descriptions of Ms. Panatoniou’s lusciousness, voluptuousness, and general anatomical excessiveness. If books could slobber, this one would produce buckets of the stuff. Oh, by the way, she’s also a lawyer. One who doesn’t appear to do any work. She could be putting poor Bernie through his paces, however, only to ka-boom him in the end with some traitorous, self-aggrandizing agenda. If that were so, it would serve him right for never raising his eyes further than her mighty bosoms. What is it about Philip Kerr’s writing and his wonderful character, Bernie Gunther, that I will miss? Kerr could tell a story and he could tell it with style. Not too many people could write humor into Nazi Germany, but Bernie is, too, Kerr’s darkly comic, wise-cracking creation. Bernie may be hard-boiled and Berlin may be noir, but Kerr presented them in his own idiosyncratic way. And to mark where I had been and to testify to what I still had in me to accomplish, I needed only that place in the new moral order offered by the bandit queen [another terrifically eccentric character], where a drifting ghost like me could feel like something real again and breathe the dream of true atonement. In 1976, eleven-year-old Catriona Daugherty was murdered. The man believed to be the murderer was the very odd Desmond Farren, the uncle of Sean and Michael. Desmond was murdered. Desmond’s brother, Danny, took over the family thug business after his father, Liam — immigrant from Ireland and progenitor of the thuggish family — was murdered. He and his other brother, Patrick, were dangerous players in the downtrodden mostly Irish community of Devil’s Pocket in Philly. As a young boy, Michael saw his uncle Patrick murdered. Michael was hit by a car at the same time and went into a coma. When he awoke he had “face blindness” and developed a new personality, “Billy the Wolf.” He could not remember what people looked like. Later in his life he had to carry pictures of people to remind him, e.g., do not hurt this one, hurt that one. For a while Devil’s Pocket was also Kevin Byrne’s temporary neighborhood. A couple of his boyhood friends have died. Another is set to become the new district attorney in Philadelphia. Kevin becomes involved in investigating a horrible murder. The father, mother and son in a family have been murdered. They were tied to chairs with duct tape. The mother was shot efficiently in her chest. Then her face was carved off and her birth certificate taken. A linen handkerchief was found with the word “TENET” written on it in blood. Eventually, Jessica, in her capacity as an ADA, joins Kevin in investigating what soon becomes several murders. They all involve “face lifts” and birth certificate thefts. They struggle to determine a relationship between the victims. Meanwhile, author Richard Montanari throws in the saga of the Farren family. They are all horrible, horrible people. Are they involved in the murders? They are more thugs than serial cult killers. Also, for a while, we follow the quiet routine of Anjelica Leary. She is a 60-something-year-old visiting nurse who cares deeply about her patients. We really like her. That dooms her, in mystery terms, to something awful. But when and, if so, why? This is essentially a police procedural with a lot of additional stuff packed in. This is when I bemoan the trend of intertwining an old story with a current one. The Farren family saga was chilling and interesting. It deserved better than the chopping up it got, but that’s how it’s done these days and that’s how suspense is driven. 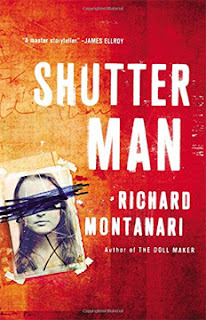 “The Shutter Man” is worth reading because it comes down to an provocative story with authentic-sounding details of a police investigation. 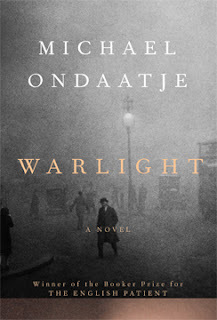 “Warlight” is the most beautiful spy book I’ve ever read, but it is not so much a book about spies in Great Britain around World War II as it is a poetic novel about how war, politics, and necessity affected the people who lived through thundering bombers flying overhead at night, the subsequent bombs changing the landscape of a neighborhood in the blink of an eye, and the mostly invisible underground war. World War II changed European agencies and it changed the expectations of at least two generations in "Warlight." Michael Ondaatje’s main character, Nathaniel — a name that apparently reeks of pretension, according to other characters — narrates most of the book, although he becomes more of an omniscient third person later in the book. First he tells his story, then he hypothesizes further afield as he describes the world hidden from him by his near and dear. When the book opens, Nathaniel is fourteen; his older sister, Rachel, is sixteen. Suddenly their parents are required to move from a comfortable life in England to Asia, for their father’s career advancement. The parents will only be gone a year, they say. In a change of plans, their mother, Rose, leaves them some time after their father. She elaborately packs her trunk and spends a few pleasurable days with her teenagers. Then she is gone. In Rose’s parental place lands The Moth. He has a real name, but not as far as Nathaniel and Rachel are concerned. He shyly flits like a moth, they decide. His is a peculiar guardianship. They almost always eat away from home. His rules are rather lax and his friends are vaguely criminous. The Darter, another sobriquet that strips whatever his real name is from our consciousness or need, is one of those friends who seems heavily occupied with transporting illegal greyhounds down wayward branches of the Thames at night. Of course, Nathaniel and Rachel tag along. As the teens grow older, Ondaatje gives the impression that they only vaguely hanker after knowledge of their mother. They, or at least Nathaniel, seem placidly accepting of their unusual status. And this is when Ondaatje turns the tale outward. In lovely little pieces, the author drives Nathaniel into adulthood and a part of Rose’s story into the light. Everything relates to World War II. And not everything is beautiful. The brutality is mostly hidden from Ondaatje’s readers, but the aftermath ripples forward. Nathaniel finally wants to know the truth about his strange childhood and his recalcitrant mother. As an adult he is in a position to find out, but he finds that truth is an elusive term. Ondaatje’s story flows in a dreamlike way. Instead of ogres and trolls, there are members of The Moth’s coterie who drift into and out of the children’s lives. Instead of a princess, there’s an impecunious kitchen helper. Instead of a king, there is The Darter. Instead of a mother, there is a queen lost in exile. Instead of specificity, there is the vague dreaminess of somnambulant characters. This would be a great spy story, if only it were a spy story.